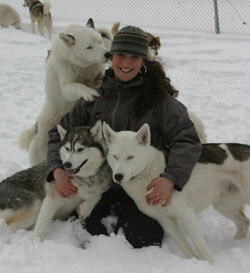 HuskyWorks Mushing Co. (HWMC) is owned and operated by Jeremy and Laura Bedortha. 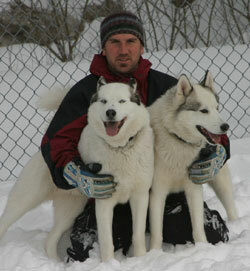 We became interested in dog sledding after getting our second siberian husky in 1998. 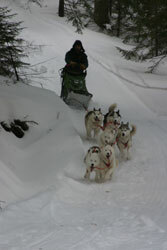 Over the years our kennel has grown in size and beginning in the 2007-2008 season the kennel began offering dog spirited adventures to the public for the first time. We moved to our current location in 2005 and have been improving the network of trails on it since the first day. The kennel is made up of all purebred siberians, each with a very unique personality. 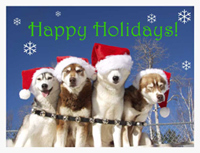 Winter time is our busy time here at Husky Works Kennel, but it is also the time of year we enjoy the most with our dogs. 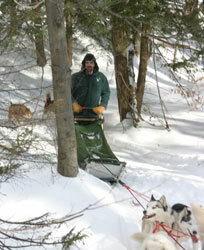 We try to spend as much time with the dogs on the trail as we can, running almost daily most weeks. We will run during daylight hours as well as taking many night adventures with high powered headlamps, or when possible by moonlight.